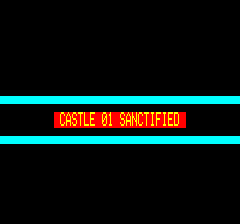 For Oric-1. A few problems on Atmos with hi-scores. 2 different tapes (at least) exist, see tape pictures ! A fun game that requires a bit of fore-thought about where you're going to be when the sun goes down! The kids enjoy this one most of all, although its pretty hard for them, what is it with kids these days .. This is definitely one of the best Oric games as it requires a degree of thinking/strategy and super arcade action blends with what DBUG mentions - a degree of stress/player panic as the fiends close in on you at a rate of knots! A masterpiece. 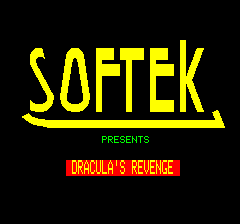 Take a bow Steve Chapman - DRACULA's REVENGE is definitely up there with Zorgon's/The Ultra/Xenon-1 etc. This game is good !!! 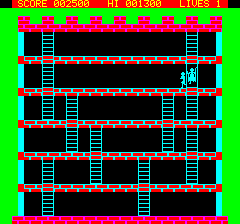 One of my all-time favourite Oric games. I remember playing this for many hours as a kid, seem to remember getting up to about level 65! I still enjoy playing it today. 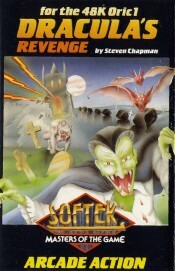 Dracula's revenge is one of these small and simple games, but that can be quit addictive. The principles of gameplay are simple, but the combinations of various methods to use in order to destroy monsters make it stressful. Ghosts can be killed by the light of day, garous only by silver bullets, and vampires only in full day light.